Many academic and industry professionals have called for more testing in computer science curricula. Test-driven development (TDD) has been proposed as a solution to improve testing in academia. This paper demonstrates how TDD can be integrated into existing course materials without reducing topic coverage. Two controlled experiments were conducted in a CS1/CS2 course in Winter 2008. Following a test-driven learning approach, unit testing was introduced at the beginning of the course and reinforced through example. Results indicate that while student work loads may increase with the incorporation of TDD, students are able to successfully develop unit tests while learning to program. This is the author's version of the work. It is posted here by permission of ACM for your personal use. Not for redistribution. 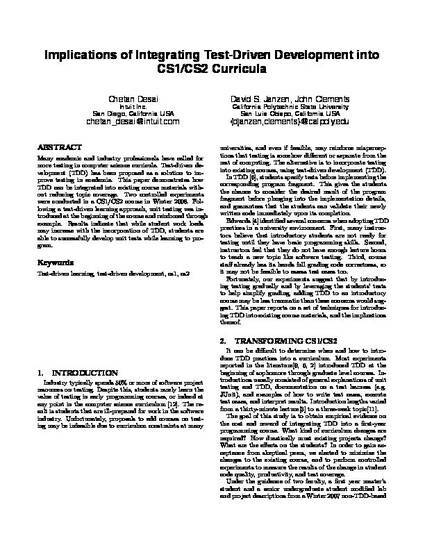 The definitive version was published in Proceedings of the 40th ACM Technical Symposium on Computer Science Education.